After watching Sofia Clothing win the Generation Next new designer competition last fall, I wrote, "I was definitely impressed by the construction, fit, and conceptual integrity of this collection; its polish and maturity reflected a defined vision." 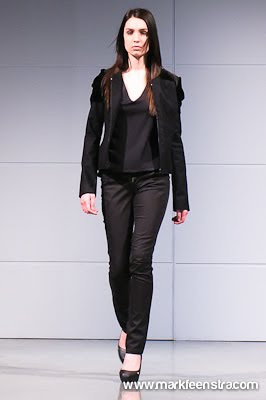 At Eco Fashion Week last week, it was with curiosity and delight that I watched her return to the runways with an impeccable fall/winter 2011 collection that bore all the hallmarks of her previous work. Working with a limited palette of black, charcoal and shades of red, Sofia created a wearable collection of mix-and-match separates. 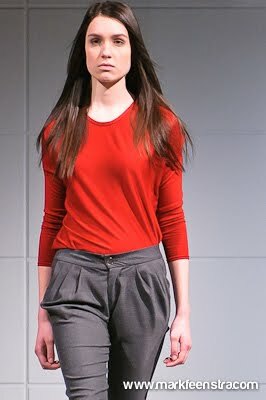 Pleated skinny leg trousers shared the runway alongside a sheer blouse, a cocoon-shaped ribbed sweater, and mini dresses that could double as tunics to be worn with leggings or your favourite jeans. 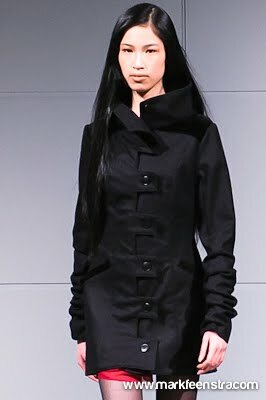 I was particularly enamoured with the outerwear in this collection. Basic dark coats can be so boring, but hers boasted tab button closures and subtly contrasting trim. On one coat, the slim-cut sleeves were left too long so that they had to be pushed up the arm for a ruching effect. 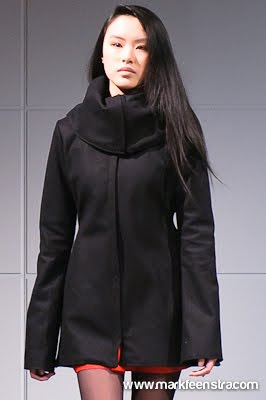 Another coat had a dramatic funnel collar. Outerwear is hard for even established designers to make and sell (the higher price point is a turn-off). For a young designer to attempt it and to include so many great coats and jackets in a collection--well, it certainly speaks to Sofia's audacity and talent. Collections like Sofia's make me excited because 1) they hint at the untapped potential of a young designer who still has a long way to go, and 2) they prove that eco fashion doesn't need the "eco" prefix to sell its wares to style-conscious consumers. Keep producing beautiful clothes, and those consumers will come for them. The "eco" part is just icing on the cake. Thanks to Mark Feenstra for providing the runway photos. These are simplistic but have nice lines. Not bad! Sometimes simplicity executed well is beautiful. :) It provides a good blank canvas for statement baubles too. I love it's simplicity and how elegant they are... feminine and strong, pieces I could have in my wardrobe for years. It makes me think more on how we dress in Europe. Love it! Ooh, I love the rich colours of the reds. Great coverage of all the eco fashion week shows; I didn't attend anything so it's great to still be somewhat in the loop about it! I actually did go to the dace event, but ended up getting in near 8 because it took us a while to find parking, so I guess we missed each other. Hope you had fun at your dance class (and P.S. I just found out that you dance with Felix (I saw a picture of you two?). I used to go to church with him!). Anyway, it was great to meet you briefly and hope to run into you again! It's nice to be able to follow a designer's growth, and you are undoubtedly impressed with Sofia Clothing's collection. I am appreciative of a minimalist, and functional set of clothes - particularly the versatility of use (i.e. your mention of mini dresses doubling as tunics). Great review, Lisa! I'm most definitely very excited to get my hands on one of those coats! I would say that the one with the squares on the front closure and those great gathering sleeves is calling my name!